All items can then be used in the microwave, dishwasher and oven. We keep items for 3 months before they are donated to charities; no exceptions. Maximum of 10 kids and 10 adults OR total of 40 adults for an adult party. We don’t have a minimum with parties. We allow parties to bring in x1 birthday cake and decoration only ** All other catering must be ordered through The Clay Café. 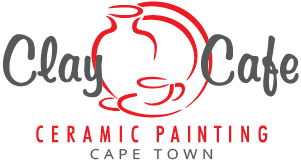 We are a ceramic painting venue; we require parties to participate in the activity. This is not negotiable. We provide plates, plain serviettes, cutlery, cups. If you want anything themed you can bring that along. There is a R500 none refundable deposit required to secure your booking; this amount is taken off your bill at the end of the party. If you cancel you party the deposit is *not refundable. There is a 10% service charge added to tables more than 10 people on your *whole bill. You can of course tip more if you are happy with the service. Final catering is to be sent at least one week before the party. Late submitted catering forms are a request and not a given. No entertainers of any sorts (including: clowns, any dress up characters, snake man, magicians etc) This is for the safety and comfort of other paying clients. Parties are set at sessions of 2.5 hours. We always have a second seating. If you need extra time please arrange this with management. We do one children’s party in the morning and one in the afternoon only. At least half the overall party has to be painting and enough catering ordered for all guests attending. All communications must be sent over email and written on the booking form. This can be sent back to us no later than 5 days before the party date. Website Design by Pxllab | 2017 © Clay Cafe. All Rights Reserved.